YZ85 The YZ85 is ready to race right out of the crate with features like a super potent 85 cc, crankcase reed-valve 2-stroke power plant, a rigid single backbone frame and adjustable suspension. Join the "Blue Team" and get ready to fill your trophy case. Engine Lightweight, compact, 85 cc, liquid-cooled, crankcase reed-valve inducted, 2-stroke single. Crankcase reed valve induction and 28 mm Keihin flat-slide carburetor ensures seamless throttle response across the powerband. Lightweight, forged piston means less reciprocal mass and less friction for a faster revving engine with excellent durability. CD ignition system provides a hot, precise spark and monitors engine speed to ensure optimal timing for quicker, stronger response during hard acceleration. This is a maintenance-free system. Smooth-shifting, 6-speed transmission with involute splines on main and drive shafts are mated to a heavy-duty, multi-plate clutch delivering maximum hook-up for outstanding acceleration and smooth, positive shifting. Clutch cover features a quick remove sub-cover for fast, easy clutch access. Lightweight radiator with large size cores and special louvers provides maximum cooling efficiency. Washable, dual-stage, foam filter ensures great air filtering performance and easy, economical maintenance. Lightweight exhaust system is specially designed to create a broad powerband with strong low-end punch. The aluminium silencer is re-packable to maintain optimum performance and reduced noise levels. Chassis / Suspension Rigid, semi-double cradle, single backbone, steel frame is ultra-lightweight and incredibly strong providing minimal flex for razor-sharp, moto-wining handling. Detachable rear subframe allows easy access for suspension maintenance. Lightweight box-section aluminium swingarm provides excellent rigidity for excellent rear wheel control and traction. Lightweight, adjustable 36 mm inverted Kayaba cartridge fork provides 275 mm (10.8 in.) of wheel travel and adjusts for compression and rebound damping. Adjustments include: 20 clicks of both compression and rebound damping. 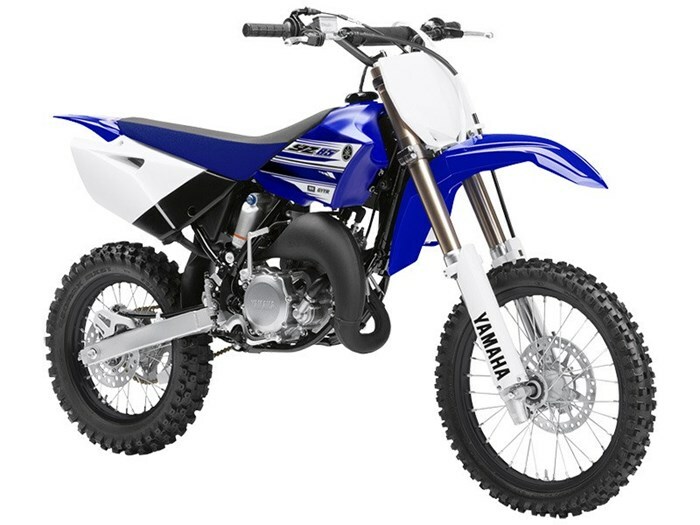 Their construction offers YZ125 / 250 type valving and low-friction seals to ensure a smooth, compliant stroke for superior suspension performance and handling. Optional fork springs are available through Yamaha Genuine Parts and Accessories. Monocross link rear suspension features a fully adjustable Kayaba piggyback shock providing 282 mm (11.1 in.) of wheel travel. The piggyback design helps to keep the shock cool during a long moto to provide fade resistant damping and consistent performance. Adjustments include spring preload, 15 clicks of compression and 20 clicks of rebound damping. Optional shock springs are available through Yamaha Genuine Parts and Accessories. 220 mm front stainless steel disc with twin piston caliper delivers strong stopping power with excellent control and great feedback. "Shorty style" adjustable front brake lever can be tailored to fit various hand sizes.